Craft, scrap, and architectural minimalism coincide in Formal Complaint. Featuring work by Aria Dean, Female Background, Christopher Hanrahan, Mario Navarro, and Megan Pahmier, the exhibition returns handiwork to formalism, maintaining a sense of slackness. 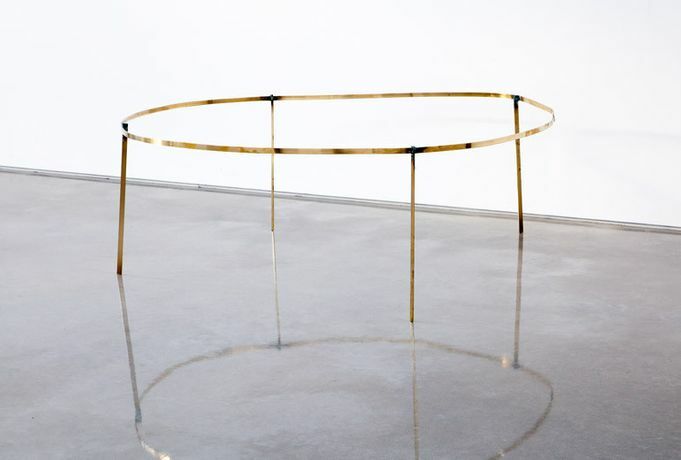 Metal armatures lean and bend precariously; a painting on unstretched canvas drags on the floor. Discarded materials and everyday objects come to conjure an upright but ‘bereft formalism’ (as Hanrahan calls it). Tenderness and despair coalesce in objects that can only just support themselves, much less make a claim for historical or philosophical significance. The works in the exhibition undermine past minimalisms from multiple directions—in terms of material, attitude, and dependence on context—but out of a care for and maintenance of form, rather than a casting off of it. Through these mergers of vernacular minimalism and sad design, work and supporting structure, Formal Complaint creates its own ecology of exhibitionary space.